Posted on December 10, 2018 by Wise Eats. In episode 4, we’re dishing up 10 weight loss tips that come directly from my 90lb weight loss experience, which was discussed in Episode 2. We also debut a brand new segment entitled, “Word to the Wise”. (Credit for the musical intro blurb goes to Joe Rogan. Credit for Word to the Wise intro blurbs go to Ariel Helwani, Joe Rogan, John Morgan, and “New York” Ric). Welcome to episode 4 of Wise Eats. Today, we’re going over 10 weight loss tips I learned from losing 90lbs. We already covered my weight loss story in episode 2, which was a deep dive into my personal story and a brief talk about how I lost the weight. Now, let’s get into the exact strategies I used. If you’re already intermediate or advanced in your fitness, these tips may be obvious to you, but they were not obvious to me when I first changed my lifestyle and finally got in shape. I’m hoping this episode can help someone else who is motivated to lose weight like I was back then. So, let’s get right to it. 1) The first thing I did in order to lose 90lbs was make the commitment to change my lifestyle, quit smoking, and lose weight. I set a specific goal, shared it with family and friends, then made it my sole focus. To always get the most out of my workouts and diet, I will always have a personal goal for my health. That specific goal will constantly change, but I will always have one for the rest of my life. I recommend that you set a fitness goal for yourself. Do you need to improve your diet, lose weight, or change some habits? What is it that you want to achieve specifically? Decide what that is, and then every decision you make from then on can be with that specific goal in mind. After I lost 90lbs, I made the mistake of not setting another goal, and my health suffered. I went back to my old junk food eating ways, stopped exercising consistently, and got extremely sick. Had I set another goal like gaining muscle, I could have gotten results much faster, rather than spinning my wheels for years and training without a purpose. Having that specific goal is crucial so you always know what you’re working toward. 2) The second thing I did to lose weight was found a message that inspired me. In order to transform my health, I sought knowledge on weight loss, proper diet, and exercise. Various websites, books, and podcasts inspired me to get where I am today. Quick fixes, fad diets, pills, and surgeries are not the answer. If you want results, you need to Wise Up. There are a million resources out there you can turn to. You just have to find one that resonates with you and that you trust. On that note, thank you for choosing Wise Eats and putting your faith in me. I hope I can inspire you the way others have inspired me in the past. 4) Start a Diet Journal. When you track your meals, you take ownership of the things you’re putting into your body. This allows you to more easily identify deficiencies in your diet, make improvements, and see where you could add things in or remove them. Restricting calories was the primary reason I lost 90lbs. I recorded every meal while keeping track of total calories per day and average for the week. I used a kitchen scale to measure my food and became an expert at reading nutrition fact labels. So, if weight loss is your primary goal, having at least a general idea of your calorie needs vs how much you’re taking in is a good place to start. Tracking meals not only helped me with calorie restriction but, over time, allowed me to improve the overall quality of my diet, so it’s a strategy I believe in wholeheartedly. The better you’re able to balance your requirements versus your intake, the more success you’re going to have. 5) Eat real food. Although I lost 90lbs while still eating plenty of junk food, eventually I focused more on nutrient quality. Calorie restriction allowed me to lose weight, but improving the quality of my diet truly allowed me to get my health and energy levels on track. I started only eating foods with ingredients that I understood. If you’re not already, start paying attention to ingredient lists. If it contains something you don’t recognize or is hard to pronounce, chances are it is not a wise choice. Take responsibility of the things you put in your body. Do some research and try to get your food from whole sources as often as possible. If you focus just on eating low calorie junk, yes, you will lose weight, but you will also damage your metabolism, hormones, and immune system. I learned this lesson the hard way after I lost 90lbs. I thought I could just continue eating whatever I wanted as long as I monitored my calories, which just left me miserably tired, skinny, and sick. By eating whole foods from good sources, you can dramatically improve your immunity, energy levels, and capacity to gain strength. We’re going to dive more into the Wise Eats Diet Plan in future episodes, so stay tuned. or even a full week of bad eating. Today, I rarely eat fast food at all, and my cheat meals consist of home cooked meals or a nice dinner out with my wife. If you want to limit your cheat meals and snacking, try not to live an all or nothing lifestyle like I did back then. Don’t use one bad meal as an excuse to fly off the rails for multiple days at a time. Enjoy yourself, but do so in moderation, and always with your goals in mind. Nowadays, I go into each cheat meal with a plan. I usually work it into my diet by restricting myself during other meals of the day. I don’t skip workouts, and get right back on track afterward. After you treat yourself, get right back to making wise choices on the very next meal. You don’t have to eat perfect all of the time to lose weight and get in shape. Aim to be perfect 100% of the time, and if you come in at 80 or 90%, that’s fine. Just try to get 1% percent better all the time. 7) Tip #7 is to start preparing meals at home. It’s time to get in the kitchen and make some wise decisions. You’re not going to find anything healthy in vending machines, drive-thru lines, or catering trucks. Go grocery shopping and start cooking. Your grocery list should be comprised of lots of healthy carbs like oats, sweet potato, fruit, and vegetables. Lean protein like eggs, chicken and fish. Healthy fats like nuts, avocados, and coconut oil. 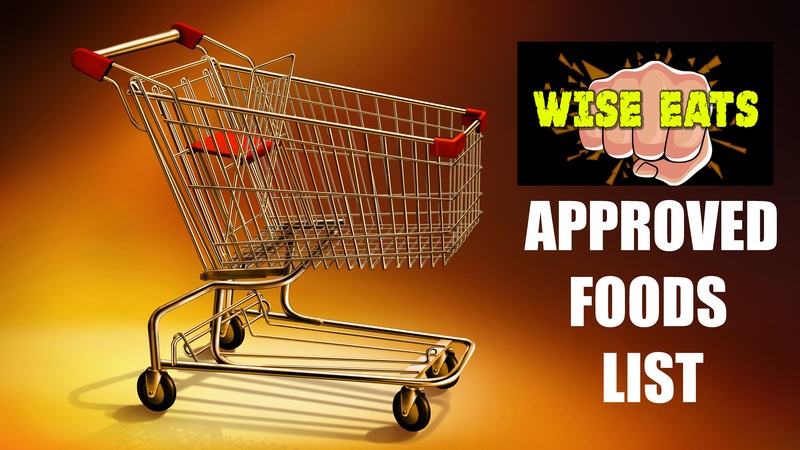 For a full list of approved grocery items, go to Wise-Eats.com/approvedfoods. In general, you should be avoiding sugary foods or drinks, frozen dinners, and most items that are packaged, boxed, or otherwise processed. When it comes to cooking, a little preparation in the kitchen goes a long way. At a minimum, you’re only a few chicken breasts and a bag of frozen vegetables away from having meals for days. Add some healthy cooking oil, spices, and a healthy carb like potato or rice. I always mix and match ingredients and try new ways of preparing things to keep it interesting, but in general, I’m having the same foods rotated over and over again. If you don’t mind leftovers, prepare large batches of food to have for future dinners, lunches, or to share with family or friends. If you’re looking for some ideas to get started, head over to Wise-Eats.com/Recipes. For breakfast, I’ll make large batches of the Wise Eats Energy Bowl, the razor’s edge scramble, or a sidewalk slam smoothie. For lunches and dinners, I’ll usually make some variation of the chicken wise rice or chokeslam chicken salad. 8) Moving on to Tip #8 that helped me with weight loss, which was to find ways to exercise that I enjoyed. I initially lost 90lbs mostly by running and lifting weights. Over time, I incorporated home workout routines like P90X, UFC Fit, and Body Beast. These types of at-home programs are great for exposing you to some basic movements and getting you comfortable performing the exercises. 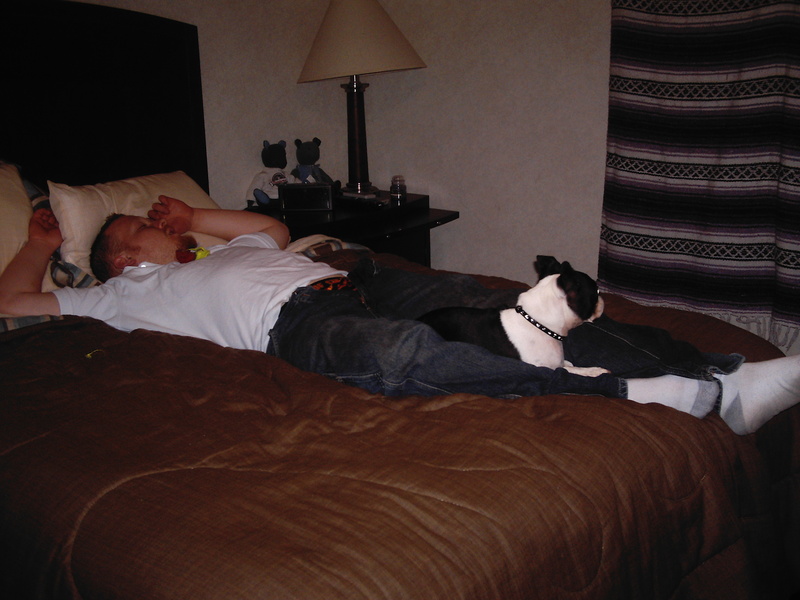 They helped me a lot initially and I got in great shape all from the comfort of my own home. If you’re willing to spend a few bucks on some essentials, working out at home is a great option. And you don’t have to spend a fortune. A few sets of dumbbells are all you need to get started. 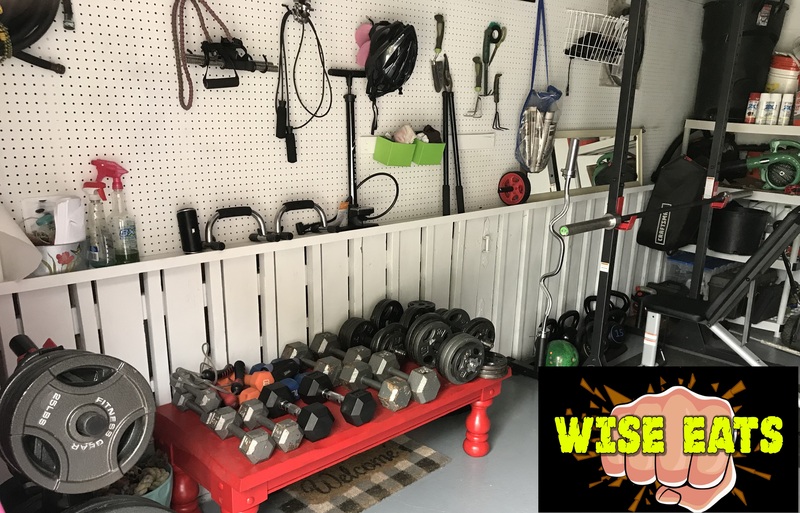 You can head over to Wise-Eats.com/HomeGym to see my list of home gym necessities. Utilize the option that is most convenient to you. You can workout at home, at work, join a local gym, hire a personal trainer, get in a fitness class, or just get outside and move around. These days, I get moving no matter where I am. I’m never afraid to stop what I’m doing to go for a quick walk or do some push-ups in order to get an energy boost. Say I won’t be in a bathroom stall ripping off some bodyweight squats, because I will! Just try different things and see what works for you. Find a friend to exercise with if you enjoy the social aspect. My wife and I love going for walks and bike rides together. She also loves doing yoga on YouTube. The key is to find something you enjoy that you will do on a consistent basis. 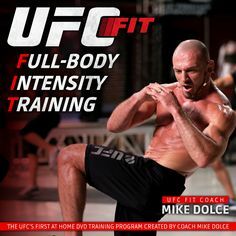 For me, I think I truly fell in love with exercise when I found the UFC Fit program. It was challenging, fit my personality, and allowed me to do all of my workouts at home, which fit perfectly into my schedule. I always felt amazing and accomplished after those workouts, and hardly ever dreaded doing them. When you find an exercise program that you’re passionate about, working out is never a chore. So, find that thing you love that you’re going to look forward to doing several times a week. Currently, I love walking and lifting heavy weights. Aside from that, I love doing HIIT training with sprints, UFC Fit or kettlebells, or trying an entirely new program. So, experiment, fuel yourself properly, and eventually you’ll find something you love, and have energy for days to do it! 9) Track Our Progress. Track your meals, track your workouts, track your weight, track your gains. Whatever your goal is, you can’t get where you want to go if you don’t know where you’ve been. 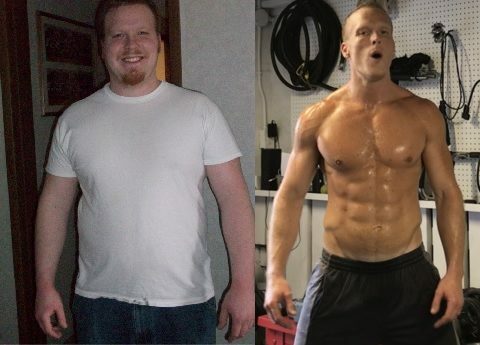 When I lost 90lbs, I constantly tracked and recorded my bodyweight, which helped me stay focused on my goal. Today, I weigh myself every morning when I first wake up so I can always evaluate my progress. Same thing with my workouts. 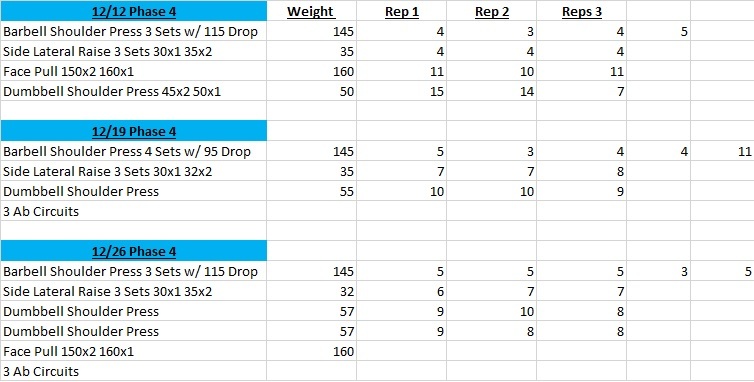 I record every rep, weight, and track it so I can see my development over time. When assessing your own progress, don’t be disappointed if your results aren’t immediate or consistent. The scale won’t always change, and you may not improve on your exercises every single time. That doesn’t mean you’re failing. If you don’t lose weight or get stronger this week, you will get there as long as you keep at it and stay consistent. The most important thing is that you see improvement over time, and it’s much easier to do this if you keep track of your performance as you go. I keep a journal where I record my weight, diet, workouts, personal goals, gratitude, and more. I suggest you do the same or something similar that fits your personality. 10) Shift Our Mindset. From processed food to real food, from calorie counting to food quality, from weight loss to strength gain. Changing the way I thought about food and exercise was critical in improving my fitness. Losing a bunch of weight was only the first step. It was a major accomplishment, but I was still just skinny and sick. In order to achieve a greater level of well-being, I had to improve the quality of the foods I was eating. Once my body was healed through regular exercise and clean eating, my energy levels skyrocketed and I actually started feeling really good, which became far more addictive than any junk food or drink I used to enjoy. Then, it was time to really focus on building a stronger, more optimized version of myself. Improving your health is all about developing small, consistent habits that become permanent changes over time. The truth is, maintaining a healthy weight is important, but it’s only one piece of the puzzle. Wherever you are in your level of health, just keep making improvements, and don’t feel discouraged if you stray from the path, because we all do. Just get back on track as soon as you can. 9 years ago, I was in the worst physical shape of my life. Today, I have a body that I could have only dreamed about back then. But it didn’t happen immediately. It took hard work, consistency, a whole bunch of mistakes, and constant improvement. So keep showing up, keep making wise choices, and you will get there, I promise you. So those are some quick tips for losing weight that come directly from my own personal experience, having been in the worst physical shape, losing weight, and finally getting into great shape, which I will discuss more in future episodes. These are habits that I maintain to this day, so I hope they can help you, as well. You may or may not have a significant amount of weight to lose, but you should have some specific goal for your health. If you don’t, think of one right now. Are you satisfied with your physical appearance and the way you feel mentally and physically? If not, what would you like to see happen? Do you want to lose weight? Build muscle? Relieve stress? Have more energy? Think about it, and be honest with yourself. Figure out what you want, and write it down. Make a commitment, develop a plan, set goals, and stick to them. Is this what you really want? Is your goal just idea in your mind? If so, it’s time to turn that idea into an action plan. What steps do you need to take to accomplish it? Write those down. Tell your friends and family of your plans. Get them on board. It’s time to make fitness a tangible objective instead of just something you’ll get around to next week or on New Year’s Day. It doesn’t start tomorrow, it starts today. So figure out what that goal is and get after it. Until you decide to make the change for yourself, it’s not going to happen. Nobody else can do it for you; you have to do it for yourself. But I want you to know I’m here to help. Whether you want to lose body fat, build muscle, achieve a personal goal, or overcome some other challenge, Wise Eats can help you get there. Feel free to reach out to me with any questions, topics you want to hear about, or stories you have to share, which you can do over at Wise-Eats.com. That’s also where you’ll find links to my free newsletter, YouTube channel, recipes, fitness tips, and more. Thanks for listening to episode 4 of Wise Eats. In the next episode, I’ll be unleashing the Wise Eats Diet Plan, so make sure you’re subscribed on iTunes or YouTube. Until then, get out there, make some changes, make some gains, and of course, make wise choices! In this segment, I give thanks to members of wise choice nation who leave YouTube comments, e-mails, or 5-star iTunes reviews. I will also use this time to answer any questions you may have regarding the show, fitness, or anything else in general. 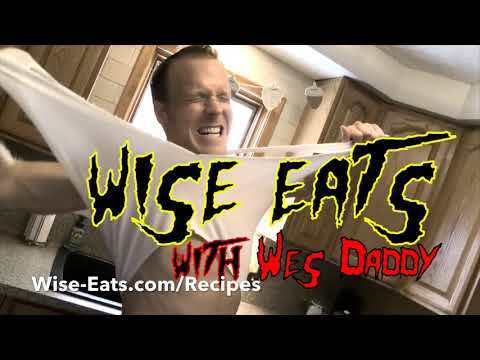 Head over to Wise-Eats.com/Contact and let me know what you think of the show and anything I can do to help. This week, I want to give a big thanks to CPentescu, who left the very first 5-star iTunes review entitled: Inspirational and Encouraging! In it they write, “Thank you for sharing your story and experiences to encourage and motivate others”. Thank you CPentescu for leaving that thoughtful review. I also want to give a shout out to WBowen05 for his YouTube Comment on Episode 3: “Too true, a healthy lifestyle is just that and takes time. Awesome work overall and hope you have a very Merry Christmas”. I hope you have a very merry Christmas WBowen05, and thanks for leaving that awesome YouTube comment! The positive feedback about the show so far has been overwhelming and I truly appreciate it.